My oldest son Matthew, at four and a half, is really into pretend play. On any given day he likes to pretend he’s running a store, flying a plane, saving the world, etc. 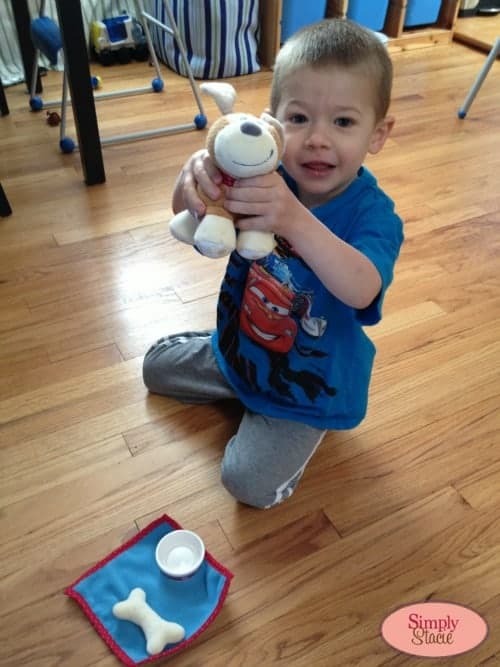 He uses his toys as his props in his playtime and I love to watch him make up and act out little scenes with his action figures and stuffed animals – which is why I was thrilled to have the opportunity to give him a new toy to add to his collection and help foster his imagination from HABA. 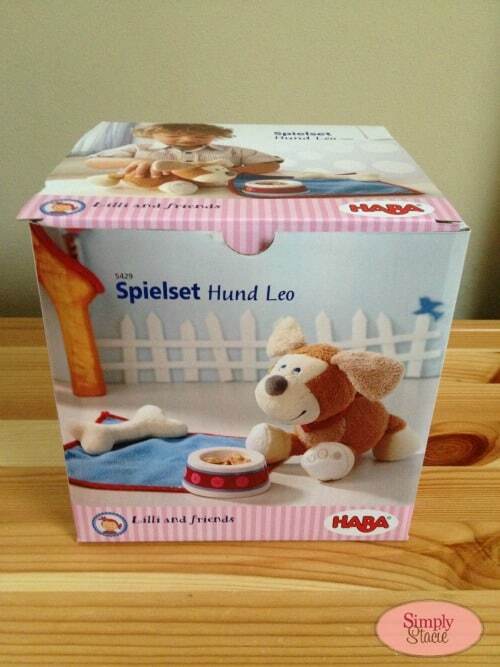 I received a Hound Leo Play Set for review from HABA. 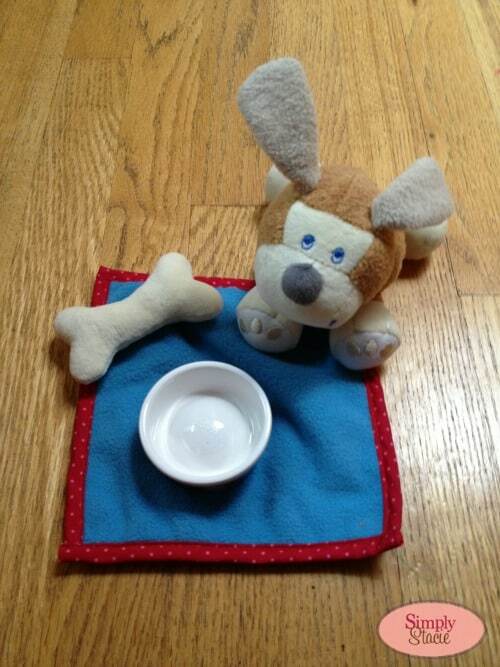 This set comes with a stuffed dog, a stuffed bone, a food dish, and a blanket – everything you need to care for your hound dog! Matthew was thrilled to receive this set, as he’s very interested in getting a pet lately (which we can’t do for various reasons at the moment). He was excited to be able to have a pet he could take care of and he immediately set up his puppy dog in a small basket so he could eat and take a nap. He said to me that he loves having “a puppy of my own to take care of and snuggle with.” I’m thrilled that he loves this set and that his imagination lets him see his puppy as the real thing. The Hound Leo Play Set currently sells for $19.99 on the HABA site and would make a wonderful gift for the animal-loving child in your life. If your little one prefers felines, there’s also the Cat Lucy Play Set available. HABA has been around since 1938, and their products can be found in over 50 countries worldwide. The HABA USA office markets toys, like the Hound Leo and Cat Lucy playsets, and residential room décor selection to specialty retailers across the USA. HABA manufactures high-quality toys, furniture & games for kids of all ages in a mission to help encourage kids as they make their way through the world using play. Their first commitment is to their customers – emphasizing outstanding quality of both their products and services. They are also committed to being socially responsible in the use of their materials, the use of energy and to the upkeep of our natural surroundings. To see the full line of products and services HABA has to offer, visit their website. baby chloe doll is cute. I like the aircraft swing, so cute, and unique! I think the Keep It Steady game looks fun for kids. This site is just wonderful I really like the Arnold Activity Hippo. American Indian Horse Lanu is a fave of mine! I also like the Sleepy Aquini Girl – 13 inch Doll, 9 Piece set, No Hair – Gotz (2013). love the shopping net vegetables! I really like the Big Optics workshop. The Paulina Plush Horse looks very nice!